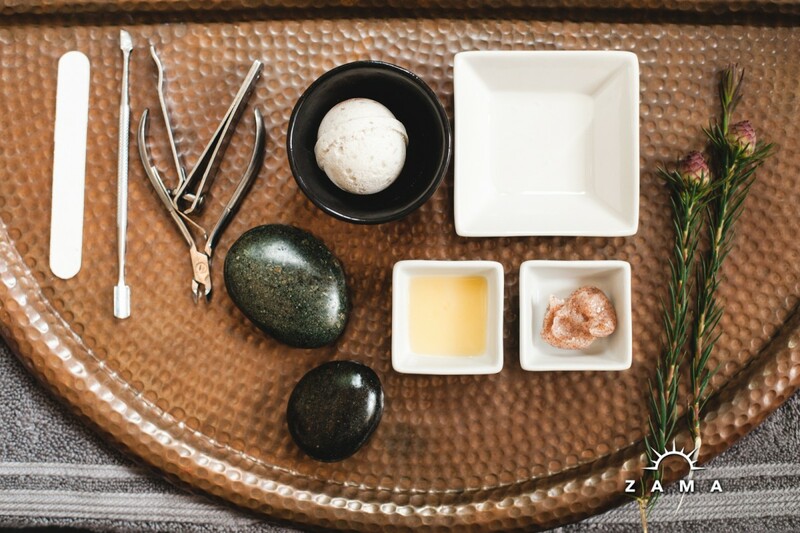 Whether you are looking for a personal escape, or a day spa experience with your best friend, our Signature Zama Pedicure is the most luxurious foot treatment going on right now in Portland. The treatment begins with a heated Hotshotz shoulder wrap, your choice of champagne, wine, Oregonic Tonic Kombucha, or sweet and spicy Zama tea. Time for an aromatic foot soak. While you sip on your beverage of choice, a Farmhouse Fresh Cranberry Orange Fizz Ball is dropped into your warm foot bath and the aroma’s immediately fill the room while softening your feet for the treatment that lay ahead. Your feet and toe nails will receive expert care. After soaking, an experienced nail tech will shape, cut, and care for your nails and calluses with their soft touch. A Sweet Tea Sugar Scrub is then applied to exfoliate dead skin cells leaving your feet soft and refreshed. From there, our hot Honey Heel glaze is brushed on, wrapped in plastic, and placed in warm foot booties to further soften and repair your hard working feet! This is your time to relax while the Honey Heel Glaze soaks into the deepest layers of your feet. The foot and leg massage will relax you even more. Your technician then removes your booties and begins the massage. The massage in the signature pedicure is the focus of the treatment using Farm House Fresh Quinsyberry Oil which fills the room with an amazing aroma! Once the massage is completed, the polish of your choice is applied to leave your feet refreshed and beautiful! But wait, the experience doesn’t end there! At the conclusion of your service you will select your free gift. Your choice of a beautiful, hand crafted beaded anklet made specifically for Zama from Puerto Vallarta, Mexico. Truly leaving your feet looking better than ever!